Roofing Contractors - Commercial Roofing Contractors. We specialize in commercial roofing and industrial roofing installation, repair and replacement. A Conquest Stone Coated metal roof will enhance your home's visual appeal and market value while protecting your investment and family. Conquest Standing Seam metal roof uses a base metal that is corrosion-resistant. Furthermore, it has a high-resin content paint designed to resist fading, salt air, corrosion and general elemental harshness. 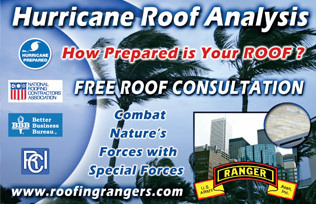 Call Now for Your Hurricane Roof Analysis! Conquest Consulting was built on a foundation of Customer service and quality of work. For over 15 years we have set the standard for others to follow. We are internationaly recognized for our commitment to excellence. We have over $800 million of commercial real state protected by our reputation. At Conquest Consulting we value our clients and we will always put their family security first when designing and installing their roof system. From families to the international corporate client we have the manpower, equipment and the technology to provide them with the most technically advanced roof systems in the world. From conventional tile roofs to the state of the art green roofing systems we have the right roof for every situation. Conquest Consulting is invested in protecting the environment. From our recycling program to our "Bio-Based Green " roof system we have helped reduce the 123 million tons of toxic roofing that our competitor put in your landfills. We have helped reduce our dependency of foreign oil by utilizing the waterproof properties of soybeans to surgically restore flat roofs. We are one of the only roofing consulting certified to apply this new technology in the world. When we are complete our clients will own a green roof system that will be around for up to 20 years guaranteed. We took a stand to put our clients, environment and our reputation first. We believe if you don't stand for something you will fall for anything.